Ilia Shikshin, "roln111" 8d, studies Go in Korea now to become a pro. Everyone sets high expectations for him, looking forward to see him getting stronger. According to miao 5d, "beatme" is Lai Yu-Cheng Taiwanese 7d, born in 1989. This information seems to be true, "miao" and "beatme" played together in rengo game on KGS, so apparently they know each other. 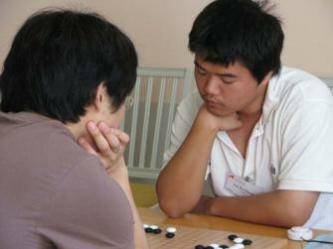 Lai Yu-Cheng Taiwanese was 3rd on EGC2008, he was the only player to defeat the winner Park Jong Wook 7d. This game was very exciting as both players have fighting style. Roln111 didn't answer ko threat at move 290, but it's hard to say whether he had chances to win the game if he continued ko fight. Thx for info. I was curious, who is beatme!